Backstage after winning the award for best male lead is actor Bill Murray (“Lost in Translation”). The film won four prizes at the ceremony. Photo by Brian Brooks/indieWIRE. 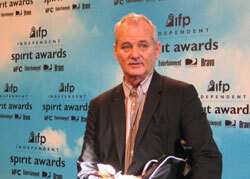 “Lost in Translation” was the big winner at the 2004 IFP Independent Spirit Awards, winning the prize for best feature, while Sofia Coppola won awards for best director and best screenplay, and Bill Murray nabbed the prize for best male lead. The awards were presented Saturday on the beach in Santa Monica, CA. “The Station Agent” was another top winner, garnering the John Cassavetes Award for best feature made for under $500,000, the best first screenplay prize for Tom McCarthy, and producer Mary Jane Skalski took home the $20,000 cash award included with the Producers Award filmmaker grant. “Monster” and “In America” each won a pair of awards at the ceremony. The other filmmaker grants, each including a $20,000 unrestricted cash award, went to a doc and narrative filmmaker. Andrew Bujalski, director of “Funny Ha Ha,” won the Turning Leaf Someone To Watch Award, while Megan Mylan & Jon Shenk, directors of “Lost Boys of Sudan,” won the DIRECTV / IFC Truer Than Fiction Award. 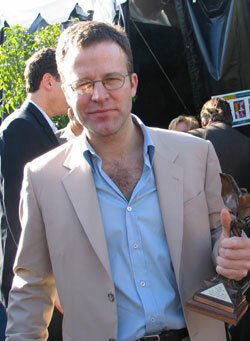 Tom McCarthy, backstage with his trophy, won the John Cassavetes Award and the prize for best first screenplay. Photo by Brian Brooks/indieWIRE. More than 1,300 guests gathered for the Spirit Awards, a major annual fundraiser for the Independent Feature Project that recognizes the best in independent film, on the eve of the annual Academy Awards. The ceremony was broadcast live on the IFC and later on Bravo. Charlize Theron, winner of the best female lead award. The film also won the prize for best first feature. Photo by Brian Brooks/indieWIRE. Keisha Castle-Hughes, star of the best foreign film winner “Whale Rider.” Photo by Brian Brooks/indieWIRE. * Executive Producers are not listed.